The United States Congress designated the Bristlecone Wilderness (map) in 2006 and it now has a total of 14,095 acres. All of this wilderness is located in Nevada and is managed by the Bureau of Land Management. 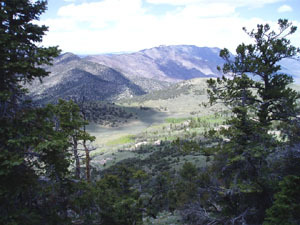 The Bristlecone Wilderness lies in the Egan Range in eastern Nevada. Heusser Mountain stands at 9,409 feet and provides spectacular views of Steptoe Valley and the Schell Creek Range. Elevations within the Wilderness boundaries range from 7,380 to 9,859 feet. Vegetation consists primarily of desert brush and grass at the lower elevations and a scattering of pinyon pine and juniper stands on the upland slopes. Groves of aspen exist in several drainages, including Rattlesnake Canyon. This area’s namesake, the bristlecone pine, is found in this wilderness as well, particularly along the northern ridgeline. Spring can be magnificent in this wilderness, with blooms of globemallow, paintbrush, blue flax, and expanses of arrow-leaf balsam root. There is high potential for spotting pronghorn antelope on the lower slopes and mule deer higher up. Rumors of big horn sheep in these hills abound. An occasional badger may cross your path as well. Planning to Visit the Bristlecone Wilderness? How to follow the seven standard Leave No Trace principles differs in different parts of the country (desert vs. Rocky Mountains). Click on any of the principles listed below to learn more about how they apply in the Bristlecone Wilderness.